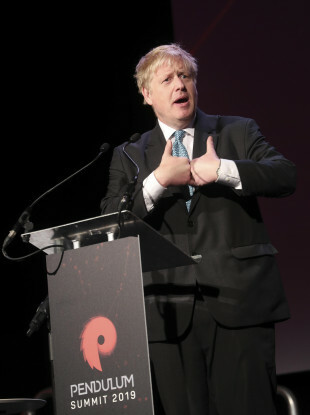 Conservative MP Boris Johnson at Dublin's Pendulum Summit. BORIS JOHNSON TOLD an audience at a pricey, business-friendly “self-empowerment” conference in Dublin today that “nobody will implement” a hard border on the island of Ireland. The summit has a number of different ticketing levels, ranging from €795-€950, with prices for the Diamond tickets kept under wraps, depending on the applicant. Johnson repeatedly told the audience that he did not see infrastructure being established on the Irish border regardless of the manner of the UK’s exit from the EU. Johnson said that there are technological solutions to the border issue that have not being explored. ”Nobody will implement it. We should not abandon attempts to find a technological solution to the border without even trying,” he said during his speech. Our two countries should be bold together. I know together we can organise it in the interests of business. Johnson comes on stage to 'The Final Countown'. He says he will talk about Brexit, but not yet. Instead, he's talking about Jaws. Seriously. He says the mayor of Amity Island was right to be sceptical about the shark, even though he turned out to be wrong. “That is entirely a matter for Ireland and if you choose to insist on every lorry and orders coming from the UK to be checked in that way, that’s a matter for you,” he said. Johnson also denied that he wanted to see the UK exit the EU without a deal, saying that he wanted a “worked out Canada-style trade deal”. He described the option proposed by UK Prime Minister Theresa May as a “terrible deal” and reiterated that he would vote against it on Tuesday. Email “Boris Johnson tells €795-a-ticket Dublin conference that 'nobody will implement' a hard border”. Feedback on “Boris Johnson tells €795-a-ticket Dublin conference that 'nobody will implement' a hard border”.